Retail $21.71 SAVE 23% ! I love this kit this kit is a lot of fun to build I love old cars so this is great for my collection this kit has a lot of cool ways you can customize it I want to add another one to my stash as this one looks so good PROS: cheap, fun to build, looks good, highly detailed, features a nice engine CONS: minor flash if you are thinking of picking up this kit then get it, it is a great kit for any old car collector and you will have many ways you can build this if I was going to give it a rating I would give it 10 out of 10 stars I am using this kit for a diorama I have about the first ever car show I went to my mom took a lot of pictures of the cars there so I build cars based on what was at the show and the beginning of my car addiction! Big 409 c.i. engine with supercharger or twin carbs. Choice of suspension, stock or Gasser. Bench front seat or bucket seats. i ordered this to hook to my 53 panel gasser. i liked it so much that i bought a 2nd one the use as a tow truck. the combo will look nice together. 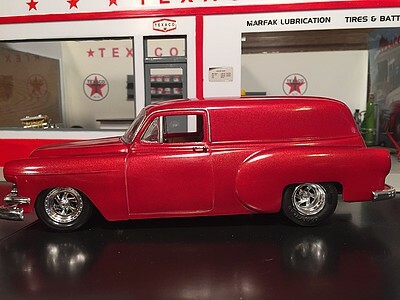 it can be built as a gasser or custom panel. either way you decide to build it, it will be a nice addition to any collection. just go ahead and order 2, and the testor&apos;s trailer and make it a set. you won&apos;t be disappointed. Had the choice of gasser or stock version. Went with stock because I needed a parts truck for my collection. Nice detail both engine and interior. Choice of engines, interior, tires and wheels. No modifications needed part fit with the normal amount of sanding off tabs and excess plastic from molding. I love this kit. I have won 2nd place in custom truck at the Mobile Modelfest in AL and the 1st place at Tigerfest in Kenner, LA with this kit. The doors are molded shut, but the kit comes with hinges for the doors. I cut the doors from the body in order to have them open. The supercharger does not seem to have any type of intake except for the four holes on top of it. I added so intake pipes on it and cut a hole in the hood to have the pipes come through. All together this kit is awesome, people enjoy my rendition and I plan on building another in the near future. Have no doubts this kit will look great on your shelf!